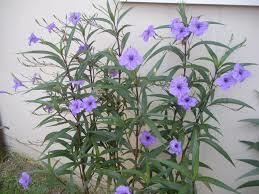 MEXICAN PETUNIA (Ruellia spp.) 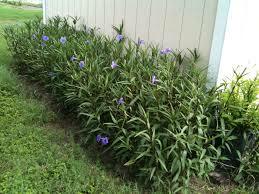 Perennial with pink to blue purple flowers spring through summer. Grows in sun or shade. Taller types are seriously invasive. R. brittoniana ‘Katie’ is the low growing strap-leafed variety perennial with white, pink to blue/purple flowers spring through summer. Grows in sun or shade. Taller types are seriously invasive. Ask me how I know.